There is an advanced TSP F Fund strategy for those of you whose retirement investment accounts extend beyond the Thrift Savings Plan. Note that when you look at the constituent parts of the Barclays Aggregate Bond Index tracked by the TSP F Fund, the index contains US Treasury securities. Because the securities issued to the TSP G Fund are preferable to those in the F Fund, some investors take a more complicated approach at times when they would otherwise invest in the F Fund. By dividing the total funds they have dedicated to bonds between the G Fund and two non-Treasury bond funds which they hold in a non-TSP retirement account, they can obtain a comparable yield with lower volatility and no risk of loss for the government portion. 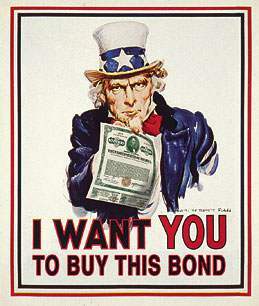 The Thrift Savings Plan’s F Fund is composed of approximately 45% US Government Treasuries and other US agency bonds, 22% investment grade corporate bonds (BBB and higher ratings), 28% Mortgage Backed Securities (MBS) passthroughs, and another 5% in miscellaneous foreign treasury bonds traded in the US. So if I was currently 100% invested in the TSP F Fund with a $100,000 balance and wanted to execute this strategy, I would first change my TSP contribution allocation and conduct an interfund transfer to 100% TSP G Fund. I would next turn to my other retirement accounts (IRA, Roth IRA, or 401K), where, assuming I had sufficient funds, I would invest $44,000 in Vanguard’s Intermediate-Term Corporate Bond ETF (ticker symbol: VCIT), and $56,000 in Vanguard’s Mortgage-Backed Securities ETF (VMBS) or, if you have a strong preference for mutual funds over ETFs, perhaps Vanguard’s GNMA fund (ticker symbol: VFIIX). There is nothing magic about these percentages, so while I would try to roughly match the TSP F Fund’s investments, it would be fine if they didn’t line up exactly. The example would be more complicated if we were in a rare situation where our current TSP allocation also included the TSP C Fund or the TSP I Fund, but that would simply require us to reallocate the 50% we were pulling out of the bond portion of our allocation within the Thrift Savings Plan, or perhaps shift a higher percentage of our stock fund allocation to the outside retirement accounts. And if you have a 401K plan, of course you are limited to whatever funds are offered in your particular plan and will have to do some research to determine what gives you the appropriate mix of intermediate-term corporate bonds and mortgage backed securities. All that said, as of this writing (September 2013), I would not be putting any money into the TSP F Fund or any bond fund. I believe that the long term trend for interest rates is up, particularly once the Fed starts tapering QE, and the TSP F Fund will do very poorly as that happens. The TSP F Fund will certainly have a few good months mixed in there as rates fluctuate, but I wouldn’t want to be guessing which months those might be. I would love to hear your thoughts or questions in the comments below or on the Message Board. Hi, as the person who prompted this post, thanks so much for the detailed explanation. I am seriously considering this. One followup question: There’s one tiny problem with purchasing the Vanguard MBS fund (VMBSX) — it’s an institutional fund with a $5,000,000 minimum purchase. I’m a few million dollars short of that minimum. The ETF version is VMBS, but I prefer mutual funds over ETF. As a substitute, what do you think about the Vanguard GNMA fund VFIIX? Good spot – we may need to bring you on board as an editor. And yes, the GNMA fund would be a perfectly good substitute – the VMBS ETF primarily holds GNMA, FNMA, and FHLMC securities so you should be getting about the same return. I have made that change above and when I get a chance I will look around for some MBS fund alternatives from some other companies. Thanks.